Tower Bridge was built in 1894 to relieve congestion on London Bridge. 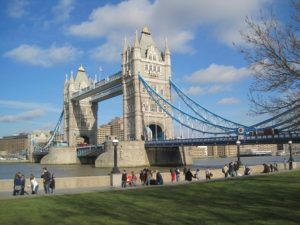 The bridge was designed to fit in well with the ancient Tower of London which it is next to. The roadway crossing the bridge can be raised to allow taller shipping to pass through. You can pay to access the walkway above the bridge which gives excellent views across London. There is also an exhibition which includes the engine room, films and interactive exhibits. There are numerous restaurants and bars nearby both east and west along the southern bank of the river and at St Katherines Dock on the northern bank.